Do You Know How to Kiss a Girl? Then learn! Do not tell her your intentions. Do not ask permission to kiss her. Look dreamily into her eyes. You may hold her right hand in your right hand, if you wish. It is well to sigh a couple of times about this stage of the game. Whisper softly that her rosebud lips remind you of cupid's bow. She will probably drop her eyes and blush when you say that. Place the fingers of your left hand under her chin and tilt back her head slightly. Draw her gently towards you. Gaze deeply at the love-lights which slumber in her eyes. Incline your head towards hers until your lips — BUT WAIT! 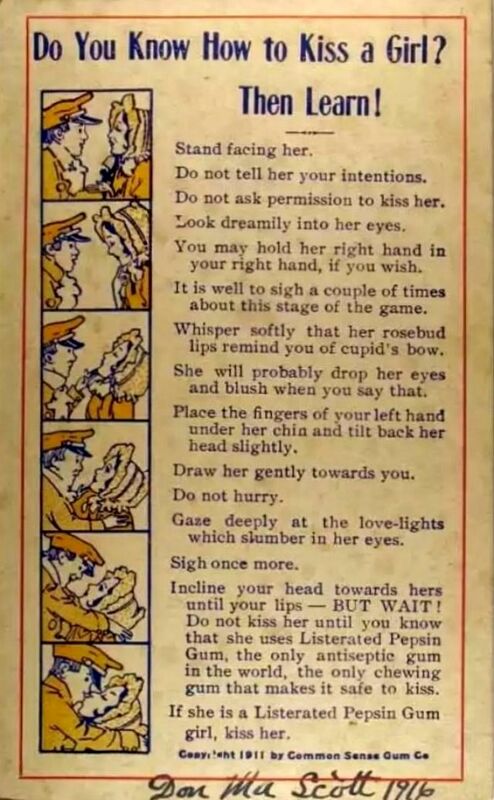 Do not kiss her until you know that she uses Listerated Pepsin Gum, the only antiseptic gum in the world, the only chewing gum that makes it safe to kiss. If she is a Listerated Pepsin Gum girl, kiss her.